Sorry, the $125 Two Buckets of Chicken. 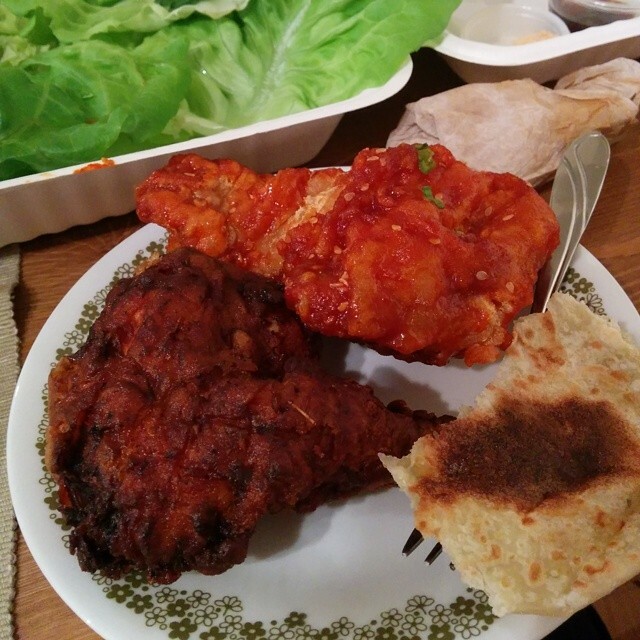 The best Korean and Japanese fried chicken (not sure why that is even a category, so specific) was voted to be from Momofuku. Using NXNE weekend and having people over as an excuse, Brent decided this was a perfect chance to splurge (the two of us cannot eat 2 buckets of fried chicken, not by a long shot). Was it worth the hefty price tag? The chicken was tasty, there is no question about that (can’t go wrong with fried)… but $125? For two chickens? Nope. Not worth it. Lately I have been making long-forgotten recipes from the bottom of my Pinterest board. Given that we were having people over this weekend, I thought it was the perfect opportunity to make cakepop, especially given I was on a roll in the kitchen as of late. I had a recipe for Tiramisiu cakepops, which required a mocha cake as the base. I just so happened to also have a recipe from Martha Stewart on my board for Irish Coffee cupcakes, but apparently the Irish whiskey icing was horrible… a perfect excuse to use the recipe as a base for my cakepops! Two birds with one stone! The cupcakes tasted like pancakes which was weirdly good. I felt kind of bad wrecking the cake by breaking it into pieces and throwing it into my little food chopper. Things were going good, the cake had turned out. My chopper could handle the cake, albeit in small batches. Then came time to mix in the icing, I was wary of this given the cupcake recipe failed to give any measurements. I switched to another recipe for a similar cakepop. It said 1 cup of icing, which is about what I had guesstimated I would need (how do you measure out 1 cup at Bulk Barn other than guesstimating?). Then came the (first) moment of truth: forming the cake + icing concoction into balls. Success!!! It worked!!! I set them in the freezer for longer than the recommended 5-10 minutes just to be on the safe side, given how well things were going I did not want it to flop. Then came the second moment of truth, the quintessential essence of the cakepop: the chocolate coating. I was about to screw this up so I followed directions from a cookbook for this part, it seemed foolproof. I set a metal bowl over a pot of boiling water and set the white chocolate to melt in the bowl. All was still going well… until I tried to roll the damn cakeball in the chocolate. Things fell apart, metaphorically, thankfully not literally. They looked awful! And I had nothing to hold them while they set. Homemade cakepops are not a good idea. I will be avoiding chocolate-coated recipes from now on. I did test eat one and it made my stomach hurt, but I am not sure if that was just my kitchen rage or the cakepop itself. After a successful trip to the farmer’s market at the Evergreen Brickworks, I had worked up an appetite- bad news for the pint of strawberries I had just bought. After polishing almost half the container, I was ready to head back out again. On the agenda for our Saturday fooding: best butter tarts and best takeout sushi. I was finally in the mood for sushi again (my sisters and I had polished off a giant party platter of it back in May). I was rather skeptical about these butter tarts, about butter tarts in general. Brent had never had one before and I tried to explain the taste to him: it’s like eating brown sugar suspended in a thick sticky almost-but-not-quite-syrup, sometimes with raisins, be careful if they are stale, they can be deceptively rock hard. My teeth hurt just thinking about it… and yet they are one of my top foods, it is too bad they are single serve. Andrea’s Gerrard St. Bakery had a chalkboard sign out front advertising their recent #1 label. That made me wonder, if it was all maybe hype? With a mouthful of butter tart,my eyes widened and nearly rolled back in my head. Brent: good? Me: you are lucky this is your first butter tart, don’t ever eat another one. Turns out what I had been eating all my life could barely be called butter tarts. This tart, this tart changed EVERYTHING. I have never been big on tarts. Changed. My teeth and stomach always hurt after butter tarts. Changed. These little heaven-tarts cannot be held in the same category with other run of the mill butter tarts, it’s just not fair- to either side. I was completely and utterly blown away. Migawd, I wish we had bought them all. I also wish they delivered. Or that I was capable of making butter tarts that good (assuming someone will divulge the secret, there has to be a secret). I wish I could say the same of the peanut butter chocolate tart that Brent got. It was not that good, in fact I traded back my half (missing one bite) for the last bite of butter tart. Leaving the bakery we phoned in our order to Sushi Marche for lunch. I ordered a few random items, Brent ordered a meal. I really thought that because it said “2 pieces” beside some things, whereas others it said nothing that I would be getting single pieces of those. I was wrong. 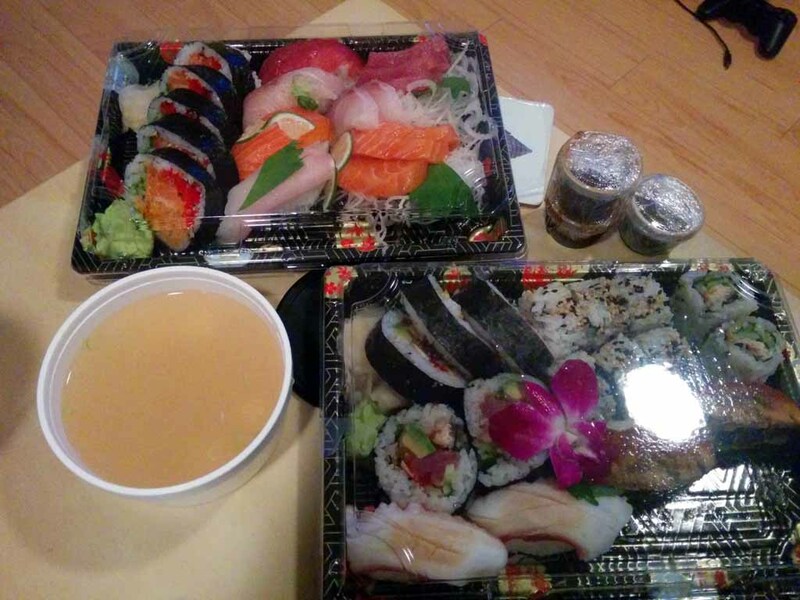 We ended up with a veritable sushi feast. There was so much sushi that we also had dinner covered. Well, Brent did. I was too full for dinner. The sushi was good, unagi for the win of course- but nothing crazy outstanding, but taht might just be my attitude towards sushi: delicious yes, but not craveable and not something I eat that often. It had been a while since I had baked anything tasty and what with it being Father’s Day weekend and my sister having just graduated I thought what better way to celebrate than with maple oatmeal cookies from the lovely, wonderful Martha Stewart? I never thought I would see the day that a MSL recipe led to disaster when followed correctly. The recipe does not list in the ingredients, only in the instructions to add 1/4 cup of water to the dough. Being the faithful MSL devotee, I obliged and followed blindly. The dough turned into a soupy, sticky mess. I put it in the fridge but to no avail. I put my trust in Martha Stewart and baked 4 test cookies. Disaster. The dough melted into a puddle, leaving oatmeal flakes in the middle. Internet said to add flour, so I did. The dough became too dry and when baked the cookies did not flatten at all. I added milk which made the dough sticky but still no dice. Chicken was on sale for real cheap, and against my better judgement, I bought yet more chicken (I still have a bunch in the freezer). I had recently finally managed to find sesame oil and was keen on cooking something with it. Waaaay down at the bottom of my Pinterest board I found a recipe for Asian Chicken Kebabs which called for 4 chicken breasts. For once in my life I had the right amount of meat and there was no complicated math involved. Lacking a barbeque to grill the meat, I instead opted for marinating it overnight and then tossing it with the peppers and onions into a pan and just baking the giant sticky mess. It smelled amazing, from the moment I set the chicken to marinate until the day after I had cooked it, my house smelled tantalizingly delicious. How good was this chicken? Brent ate a full serving of it. THAT is how good this recipe is. Another keeper. Iced Coffee For the Win!!! I am an unabashed coffee addict, I live for coffee, it fuels me and you do not want to see me without my morning coffee. Once summer rolls around however, my wallet loses few pounds. All my change goes to Tim Hortons for them damn-addictive iced coffees. They had me from day one when they first introduced them by giving away free ones. I was downtown, I hit up about 6 Timmies and did not blink the rest of the day and so was born my love affair with iced coffee. That love affair only grew more a few months ago when I had the joy of sipping on a glass of cold brew coffee. One day recently, as I was paying for my iced coffee with my credit card,… maybe I should make my own iced coffee at home. Duh. I was not about to settle for brewing a lot of coffee and then just letting it sit and get cold- that is gross. I found a recipe for cold brew that seemed simple enough. Except for the fact that I was lacking the key piece of equipment: a french press. I’ve never been big on french press coffee, too much work. All I had laying around was flavoured coffee (my secret weakness). I thought what the heck, might as well try it out. The first batch was about as strong as a regular cup of coffee- not quite what I was after. I wanted really strong coffee so I could add a lot of milk (no ice, ice is for suckers). I made the second batch stronger but combined it with the weaker one. I admit, it looks gross sitting in my fridge in a mason jar, and I worry it will fall over and spill. But migawd, half coffee half milk with a dash of flavoured creamer (like I said, artificial flavours are my secret weakness)… and I am in iced coffee heaven.